Location: Spanning the Mawddach estuary and linking the A 496 with the A493. Second-half C19 timber toll bridge, probably dating to 1868 when the Penmaenpool bridge company was incorporated. The company originally rented the roadway for ú10 per annum from the Hengwrt estate. Tickets were adopted on 1st March 1937 and the bridge is still in use today. The toll booth was added c.1900. 19 spanned sections on piers formed of 4 cross-braced timber piles and with a timber deck; the central span originally opened. Plain handrails; slightly ramped to centre. Gate to SW end with polygonal cast iron piers with ornamental caps. 2 wrought iron gates with tulip finials and lock rail; pedestrian gate inset to R.
Toll booth to E at SE end; lap-boarded timber-framed structure on timber piers. Shallow jetties to gable ends, carried on brackets. Moderately-pitched felted roof; finials with pendants,plain, bracketed eaves with bargeboards. Raking dormer facing bridge with felted roof and cheeks; deep verges and brackets. Canted, transomed 5-light small-paned window to corner by bridge; entrance alongside. 3-window rear elevation. 3-light, transomed to the L, 2-light transomed to centre and single light to R, all small-paned. Listed for its special interest as one of very few surviving wooden toll bridges still in operation. Spanning the Mawddach estuary and linking the A 496 with the A493. 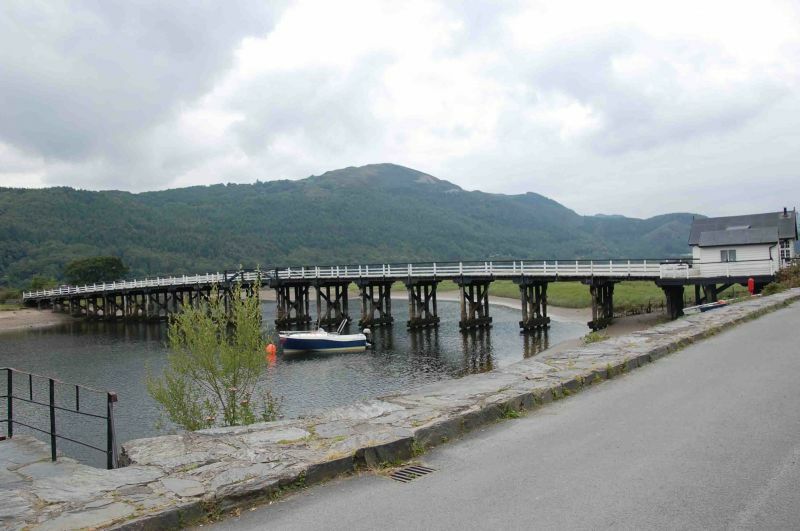 Situated beside the former Cambrian Railway station, linking the A493 with the A496 across the Mawddach Estuary. Prominently sited on the roadside in the centre of the village.